At Farm to Chopsticks on August 10th, we are recognizing three AMAZING people who help make our work possible. One of those is Carol Lee! Carol Lee has devoted her entire professional career to the nonprofit and philanthropic sectors, and is currently a member of the grants management team at the Conrad N. Hilton Foundation. In her free time, she manages the Circle of Change, a giving circle that supports Asian American and Pacific Islander organizations working to make a positive change within AAPI communities located in the Los Angeles, Orange County or Inland Empire areas. Carol is a native Angeleno who cherishes all the diversity and good food that LA has to offer. She also enjoys Fitbit challenges, the occasional half-marathon, and overanalyzing her favorite TV shows and movies. How did you first get connected with Forward Movement (then APIOPA)? I first learned about APIOPA/Forward Movement through a mutual friend, Sissy Trinh. She told me about your CSA program and I ended up signing up. That was I think 5 years ago? It’s been quite a few years! What keeps you involved with this scrappy nonprofit? The CSA program was great. My mom certainly appreciated the freshness of the vegetables. By the time the Historic Filipinotown location was discontinued, my involvement changed. I had nominated APIOPA for funding through my giving circle for several years and saw the organization’s growth over time. I had made new friends and now I look forward to the monthly hikes. As a former Roots Community Supported Agriculture subscriber, can you share what your experience was like with this program? Why should someone consider joining the CSA? I really liked the program when I was a subscriber for several seasons. At the time, I lived with my mother so the vegetables were primarily for her use, but I got to enjoy the fruits of her labor! She would always remark that she could tell the difference between the CSA vegetables and the ones she bought at Asian markets. She looked forward to the Sunday pickups. The CSA was also a good way to be introduced to unfamiliar vegetables and APIOPA/Forward Movement would provide tips on ways to cook them. Lastly, I felt good about supporting Asian farmers. I would still be a subscriber now if it were more convenient with my schedule but that hasn’t worked out yet. In efforts to make fresh and affordable produce accessible to our neighborhoods, APIFM launched pop-up markets at KYCC’s Menlo Family Apartments in Koreatown (July 10) and PWC’s Larry Itliong Village in Historic Filipinotown (July 24). Local residents selected from the fresh produce provided by local farmers who are part of Roots Food Hub, a food justice project of API Forward Movement. 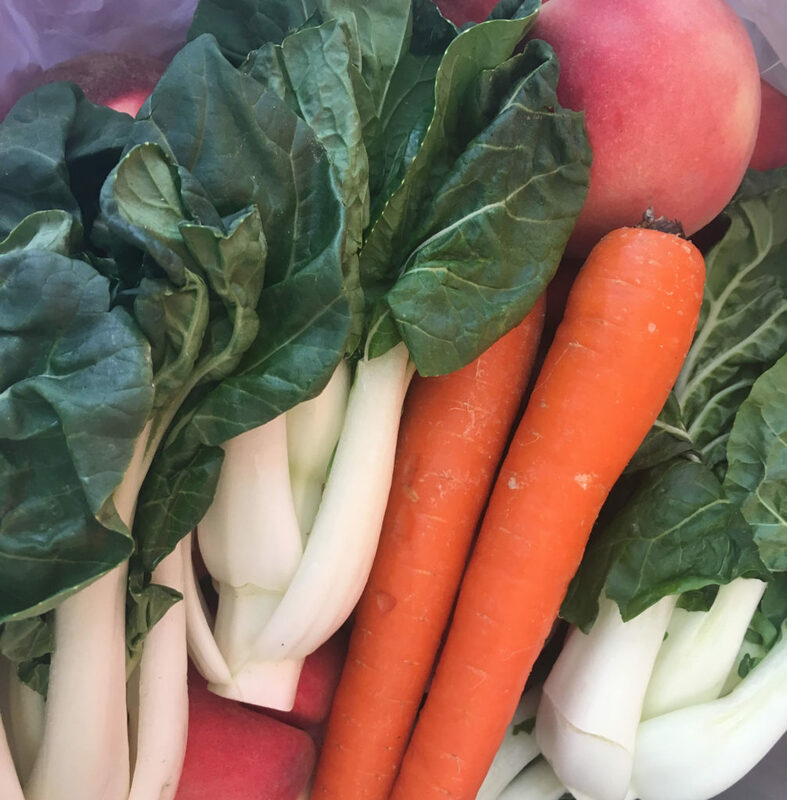 A variety of choices were provided to the residents including baby bok choy, cucumbers, carrots, grape tomatoes, nectarines and peaches. APIFM subsidized produce costs by 50% to help make these locally grown produce affordable! All produce was sold out at both pop-up markets with residents eagerly asking for more!